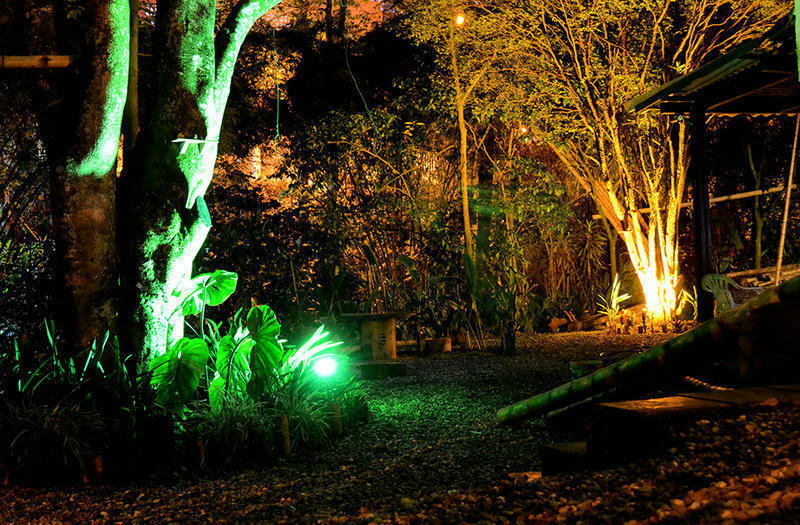 Bambú is a glamping country side house surrounded by beautiful nature. Lots of trees many kind of birds and squirrels are our neighbors and a little creek passing next to our garden so you can feel the real sound of the nature. We are located in la Zona Rosa of Medellín, just a few minutes walk of hundreds of restaurants, bars and best night-clubs of the city. Also is very close to main avenues with public transportation routes and to the metro station so you would be able to move easily around the city. As a difference of other hostels, our private bedrooms are two amazing glamping tents equiped with double bed, flat screen tv with Direct TV located in our huge garden surrounded by beautiful nature. Check out the pictures. We are completly sure that we have the best dorms in the city: comfortable private beds in dorms each of them with its own light and electricity plug. 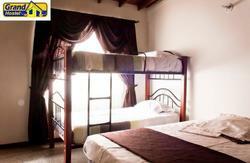 Fully equipped kitchen, brand new bathrooms with hot water 24 hour, TV room, free WIFI are among our facilities. Tell the driver to take you to ''La 10'' street in El Poblado, and drive straight up to the hill to the ''carrera 33'' then turn one block to the right and then two more blocks to the left, and after a little creek you will see the house on the left. Remember, in Medellin, the taxis must have the taximeter on ALWAYS. The cheaper way is taking the metro: Take the train in the ''Caribe'' metro station (it is connected with the bus terminal by a bridge). Buy a ''Poblado integrado'' ticket (around 3.000 COP - 2 USD) they will give you 2 tickets, one for the train and one for the bus. Take the metro to the south and get off in ''El Poblado'' Metro station. then in the right side of the station you will find little buses that says METRO, take one of those up to the hill and get down in ''El corral'' or 33 career (you will see El Corral in the left but you need to go to the right). then go right in 33 career one block and then to the left two more blocks and after a little creek you will see the house on the left. The easier way is to take a taxi. It will charge you around 6.500 COP (3.5 USD) Tell the driver to take you to ''La 10'' street in El Poblado, and drive straight up to the hill to the ''carrera 33'' then turn one block to the right and then two more blocks to the left, and after a little creek you will see the house on the left. You can also walk from there to the hostel. It will be a 50 minutes walk. We DON’T recommend it because it could be a dangerous area, especially at night. The easier way is taking a taxi, it will charge you 65.000 COP (33 USD). This price is already set for all the taxis there, but still, before taking a taxi ask the driver how much is it so he won’t charge you more. 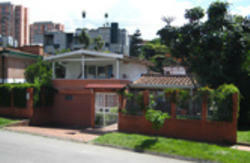 Tell the driver to take you to ''La 10'' street in El Poblado, and drive straight up to the hill to the ''carrera 33'' then turn one block to the right and then two more blocks to the left, and after a little creek you will see the house on the left. This taxi doesn’t have a taximeter. The cheaper way is taking a bus from Airport to Medellin, it will charge you around 8.000 COP (4 USD) to San diego shopping Center. From there you take a taxi, it will charge you around 9.000 COP (4.5 USD) Tell the driver to take you to ''La 10'' street in El Poblado, and drive straight up to the hill to the ''carrera 33'' then turn one block to the right and then two more blocks to the left, and after a little creek you will see the house on the left. Please be careful with the bus you take in the airport because one of those may take you to north bus terminal, not to San Diego. If that happens, don’t worry, we also have directions to get to the hostel from North Bus Terminal. If you get lost, you can call us at any time!